Your knee is the largest joint in your body. The bones of your knee are separated by two strong rubbery discs of cartilage called menisci (plural) or meniscus (singular). Your upper leg bone (femur), and lower leg bones (tibia and fibula) are joined by ligaments, tendons, and muscles. Your bones are covered by articular cartilage, that absorbs shock and provides a smooth, gliding surface for joint movement. Sudden knee injury often happens after a fast twisting action. Pain in your knee can be very mild or very severe, depending on how your injury happened. Pain and swelling are the most common signs of knee injury. It might feel like your knee is catching or locking up. You might feel unstable, like your knee is giving way. This page focuses on severe soft tissue, meniscus, tendon and ligament injuries. There are other pages for anterior cruciate ligament (ACL) injury, broken knee (knee fracture), broken kneecap (fractured patella), and dislocated kneecap (dislocated patella). 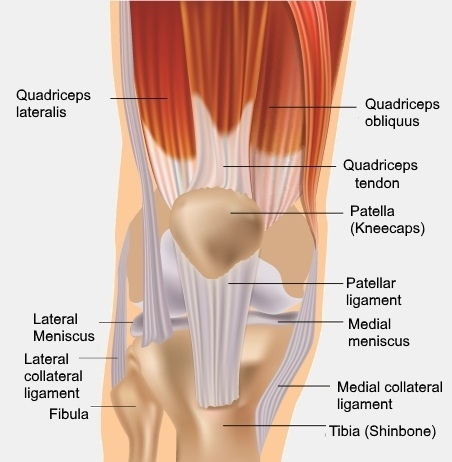 Knee injuries can go on to cause other problems such as osteoarthritis. Soft tissue knee injuries can be hard to diagnose if your knee is too swollen and painful to examine. Your GP or nurse practitioner will ask about the symptoms you've been feeling. They may ask you to come back in a week or two to allow the swelling to go down, so they can examine you properly. You may need an X-ray or an ultrasound scan to find the exact problem. If it's likely that you'll need surgery to fix the problem, you may be referred to an orthopaedic surgeon. If your knee isn't too swollen, it's generally safe to apply first aid, such as RICE, and wait a week to see if it settles down without treatment. It's a good idea to visit your GP if your injury doesn't seem to be settling down after a week. you can't straighten your leg. Treatment depends on which part of the knee you've injured. If your knee is very swollen and painful, you may be given a compression stocking (called a Tubigrip) to reduce swelling, and crutches to help you walk. If you've damaged a ligament but your knee is still stable (e.g., it doesn't give way under your weight, for example), a physiotherapist can help you to strengthen your quadriceps muscles. If you've torn your meniscus (knee cartilage) and your knee is locking, you may need keyhole surgery to repair or remove the damaged part of the meniscus. If your knee is not locking, the recommended treatment is physiotherapy to strengthen the muscles around your knee. If you have severe knee pain, you should stop exercising as it could make the problem worse. Apply first aid to the area (using the RICE method). Follow your treatment provider’s advice. If you smoke, stopping will make it easier for your body to make new blood vessels and heal. Keep any wounds clean, dry and covered. If your knee injury is affecting your ability to work, talk to your GP or nurse practitioner. It’s not uncommon to need time off work with these kinds of injuries. You could ask ACC about assistance so you can return to work. Information about bones, cartilage, ligaments and tendons. Endorsed by an orthopaedic surgeon. Page created March 2018.